I love projects like this one mainly because it shows what can be achieved with some free thought and creativity at very low cost – what’s not to like? So, what follows is Steve’s story of how he converted the old Matchbox toy into an impressive addition to his Warhammer Imperial Guard collection. Planning a diorama with Warhammer Imperial Guard acting as “Peace Keepers” I wanted to include a wheeled armoured personnel carrier (APC) but there was no suitable kits. To fit the bill I bought an old toy rocket launcher from the Matchbox series with a view to converting it. The starting kit had a spring loaded mechanism that opened up to allow the launcher to be fired as shown below. The toy was stripped to its component parts and the rocket launcher and radar system discarded. Where the radar was removed, a mount was fitted to attach an auto-cannon from the spares box to the vehicle. The next stage was to fix to roof doors in a permanently closed position, fill the gaps with Milliput and sand to give a smooth body. 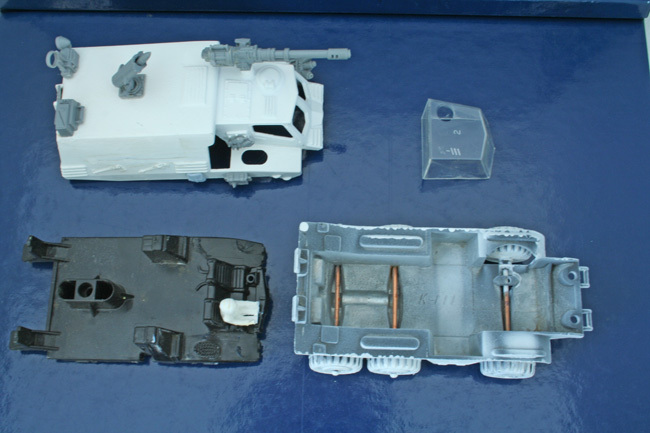 The spares box was raided to add a communication array at the rear and a missile launcher in the centre of the roof plus a few other accessories. A driver from a toy racing car was cut down to fit and the body and chassis primed with automotive primer prior to assembly.